This beachfront 7-bedroom, 6 baths house is composed of 3 separate buildings. Each buildings are only few feet away from each other on the first floor, and linked by wrapped around decks overlooking the beautiful sandy beach and ocean on the second floor. Life guards are on duty during the summer season. (No beach badge provided). This house has a 120-foot sandy beach frontage with beach access path few feet away from the house. It is located at the epicenter of Beach Haven, yet in a tranguil and secluded beachfront location surrounded by beautiful pine trees which provide excellent shad and privacy. The house is only 4 blocks away from the entertainment center of the Island, which includes the Fantacy Island amusement park, a water park, Bay Village shopping center, a marina with public boat ramp, Hands department store and countless restaurants and shops. You will be awaken in the morning by the glow of the stunning sunrise on the horizon, acompanied with the singing of seagulls. The house provides unobstructed panoramic ocean and beach views. The south building has two bedroom suites, one on each floor. Each bedroom has a full bath with a pair of twin beds. A huge deck on the sand level is ideal for outside dinning, sun bathing and gathering. Another deck on the second floor provides panoramic view of ocean beach. The main building has 4 bedrooms and 3 full bathrooms. The master bedroom has a queen bed and a large sitting area and a private full bathroom. Two of the other bedrooms have a pair of twin beds each, and the fourth bedroom has a queen size bed. A family room with a wet bar, a living room and a gourmet kitchen are also in the main building. There are also patio doors lead right to the decks overlooking the beach. The second floor deck provides direct access to north and south buildings as well. This house is a beachfront paradise indeed. This was nice beach house for a large family gathering.....plenty of room and privacy when you wanted it. The houses are in pretty good shape despite the weather and storms that they've experienced in recent years. The beach front location is fantastic. We walked to restaurants, shops, bike rentals, etc. It's on a nice, quiet street with minimal traffic flow. We highly recommend this property.....have fun like we did! It was a great beach house with plenty of room for my entire family! The views were spectacular! My only problems were that the cleaning crew did not show up till 5 minutes before we were scheduled to rent (no reflection on the owner) and that there were no stem glasses for our wine. That is not a big problem at all, but not to worry, we bought some for the house and there stem glasses now. With 6 bathrooms and 7 bedrooms we were all in Heaven. The owner was very accommodating and answered all my emails, questions and concerns. He had a great property manager too. I would highly recommend this house! Dear Christina and Bill: Thank you very much for leaving a review about your recent stay at our beach front home in Beach Haven. I am very glad to hear that you, your family and your guests enjoyed the stunning view and wonderful beach front location of our home, and had a wonderful time at the beach house. Due to the heavy island traffic on Saturdays in the season, and particularly after a down pour of heavy rain which might flooded the roads, the cleaning crews could have delays on their arrival. I sincerely apologize for that this situation had occurred before your check-in. I have informed the cleaning company about this problem, and hopefully they would send their crews out earlier from now on. Again, thank you for your comments, and hopefully you will come to share the joy of using this beach front home again next season. My family came from several states and we spent the 4th of July week at this house. What a great time, had everything and more. I would wake up and sit on the top deck for an hour before going down for coffee. So relaxing and fun, so much so the whole family is going back next year and we most certainly will be staying in this house. You can walt to all stores and attractions, short hop onto the beach, plenty of room and a nice decor. The owner is a very nice and accomodating person. Try it you will love it. It is the most rewarding to hear that you enjoyed the house as much as my family do. We are so glad to learn that you had a great time. Thank you for your kind words. We warmly welcome your family to have your summer vacation with us again next year. 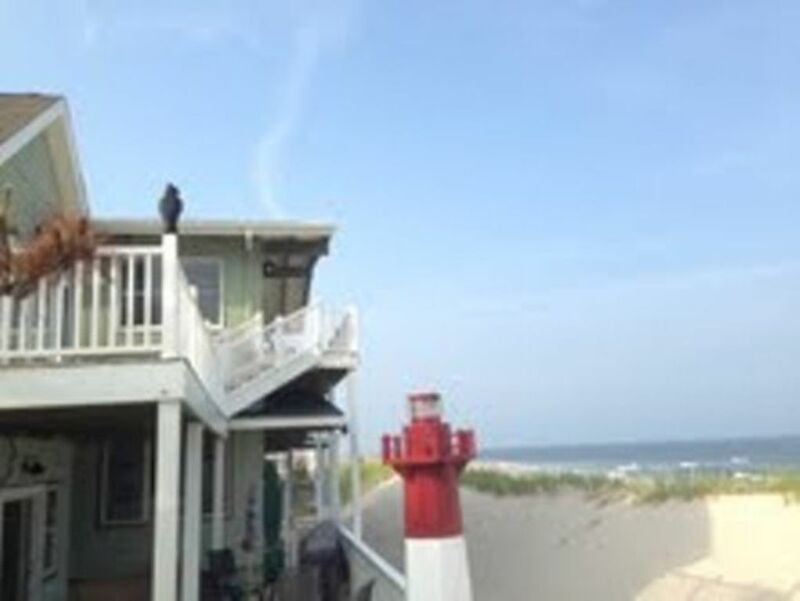 We originally picked this oceanfront house for our reunion of 16 people due to its size. We were very surprised to find that it is at the epicenter of Beach Haven. It takes only few minutes walking to everything, Bay Village, Water Park, Fantasy Island, even a 7-Eleven and a department store (Hand's). Yet it is nestled in a woody, seclude beachfront location which is very quiet. It is a perfect location! The house is right by the sand dune with very wide ocean frontage, and has stunning views of beach and ocean surf from basically any location of the house. The property is composed of three structures and is rustic and colonial in style. Which make it very interesting and suit our beach going spirit. We all love it! There are kitchen chairs made of beer barrels. Old hardwood floors with nautical lamps, etc. There are some minor issues of cleaniness, which is understandable due to the size of the house and the beachfront location. Their contracted cleaning company did leave a number on the dining table for us to call if any issue needs to be taken care of. That is nice. We had a great memorable beachfront reunion. Thank you very much for your review,. We are glad to learn that you have a good time at the house. To imporve the house keeping issue, we have switched to another professional cleaning company, and hope that they will do a better job. We look forward to having you returning to this wonderful house for years to come.